GentlemanCthulhu.com | Happy Valentine’s Day…Now Show Us Some Love! This year, I’ve got something special planned in honour of the day of love, and to commemorate the popular and longest running series in this two-and-a-half-year-running web-comic: the And They Call it Mummy Love series. Presently, all of the Mummy Love comics are completed (on my end), and will be publishing once a month until the end of this third year of Gentleman Cthulhu (August 2018). 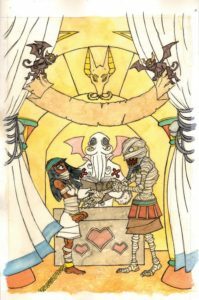 So, in honour of this milestone, and as I had planned soon after I began developing this mini-series, I’m putting together a collection of all 24 Mummy Love comics for the end of this month. The cover (seen here) is currently in development, and I should have that and the book easily finished to send to the printer at the end of the month. But if you’d like to receive an early copy, and help support the printing costs of the book, head over to my Patreon and add your name to my list of supporters. At just $3.00 you can have your name appear in the back of this special collection, and get early access to Gentleman Cthulhu comics. If you decide to go for a higher level of support, even more rewards are available to you. I’ve already reached my third goal on the page (funding this comic’s production costs)—and it would be great if I could hit the next milestone. That said, I’m (slowly) working toward getting the collections of the first and second year on other sites, but they are still available on IndyPlanet in digital and print formats. So if you haven’t gotten your copy of those yet, make sure you pick them up (listed on the Collections page; newly redesigned, just as the Archives page has been). Whatever the case, happy reading, and check back on Friday for another comic (to make up for last week; and a Mummy comic, no less)!